Submitted by lynn on Tuesday, November 18, 2014 - 8:59pm. It's beginning to get chilly in San Diego, at least by our standards! Now's the perfect time to find that warm bowl of soup to keep us feeling toasty inside and out. 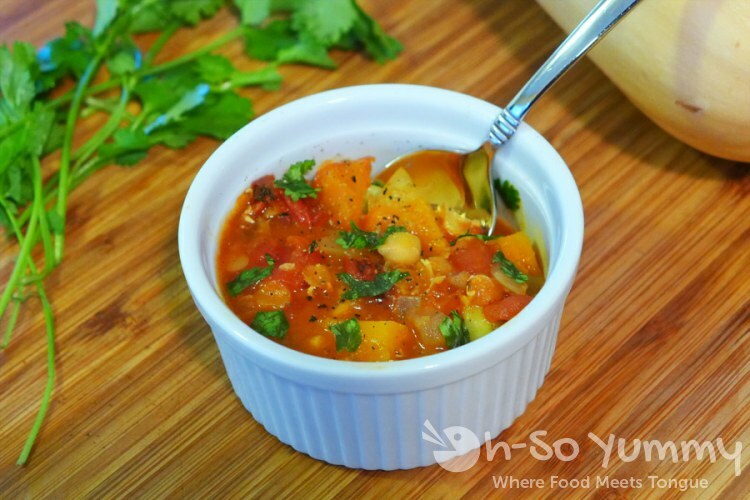 This Moroccan Spiced Lentil Soup with Butternut Squash, Garbanzo and Fava Beans fit the bill for me and is pretty healthy too! 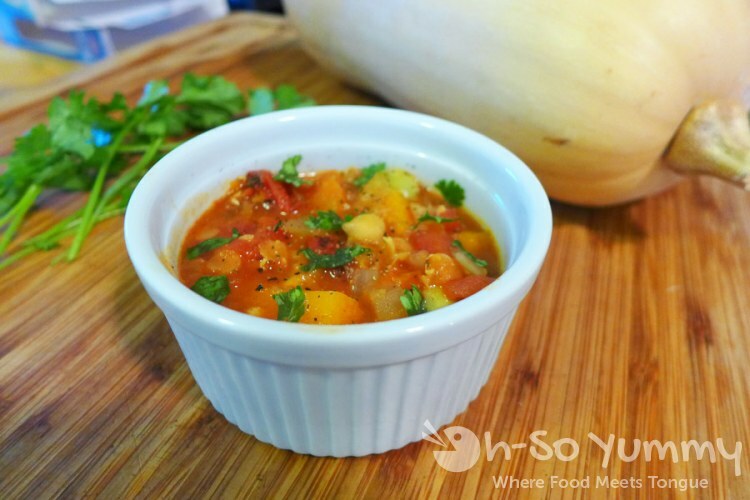 It'll be my second recipe on Oh-SoYummy and it won't be the last! Today's recipe was made possible by Melissa's Produce, who sponsored this San Diego Food Blogger Challenge. As before, participants were sent a box of produce and asked to use 3-4 ingredients to create a recipe. 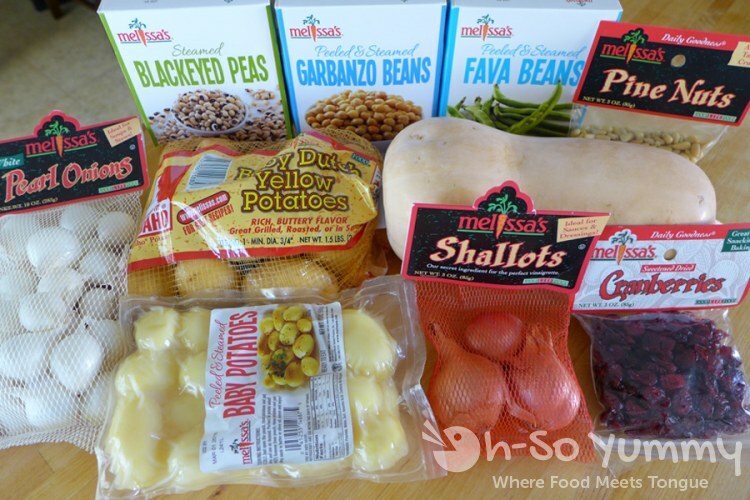 This time the box included a few already steamed and peeled items: Blackeyed Peas, Garbanzo Beans, Fava Beans, and Baby Potatoes; a few fresh ingredients: Pearl Onions, Baby Dutch Yellow Potatoes, Butternut Squash, and Shallots; and a bag of Pine Nuts and Dried Cranberries. Oh boy, what to choose! I ended up with butternut squash and the ready-to-go garbanzo beans and fava beans. I also gave the fava beans a quick taste test to make sure I'd like them in my food. I found them to be much better than lima beans. As for the rest of the ingredients, they'd be used in other recipes. Once this soup got going, the house began to smell really good. After pulling it off the stove, I plated it and added the cilantro. Beautiful. Let's eat! Heat the oil in a large dutch oven (5-6 quarts) over medium heat. Add the onions and cook for 2-3 minutes. Add the garlic and cook until both have softened. Add the ginger, turmeric, cinnamon and stir to mix. Stir in the diced tomatoes, sugar, lentil, squash and pour in the broth or stock. Bring the mixture to a boil, then reduce heat and simmer, covered, until the lentils and squash have softened, about 25 minutes. Add the garbanzo beans and fava beans and simmer another 10 minutes to allow the flavors to meld and the soup to heat through. Add the cilantro and add salt and pepper to taste. Link to other recipes in this roundup. Disclaimer: Melissa's Produce sent me a box of products for this recipe challenge. I was not paid to write this post, and all opinions and experiences are my own. Oh how I love a good lentil soup!!! And you've done a fabulous job with the challenge box ingredients in this one. Definitely a keeper of a recipe! Ever since working at a middle eastern restaurant in college, I have been a huge fan of lentils in ANY incarnation. This looks gorgeous! This soup sounds nice and hearty! I have never used Fava beans before. I just kind of stared at the box and used something else, haha. Lots of good spices in your recipe- if I received all those ingredients, I wouldn't know where to begin! I'll certainly be spending some time looking at the other 'challenge' recipes too.